Do you want to offer your users real added value and appeal to the users who are interested in e-bikes? 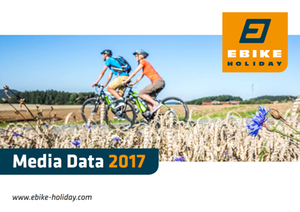 Take advantage of the reach of the biggest e-bike holiday portal! Present yourself with your advertisement in an attractive user group that is open not just to the topic of travel. Make your range of services visible starting from the 2017 e-bike season and gain new customer potential! Benefit from the cross-media EBIKE HOLIDAY network! Do you want to place advertising in the EBIKE HOLIDAY media?